Musings of a Gardener in Victoria, Australia, as she moves from one garden to another. It is December - it is summer. 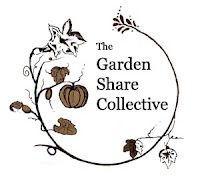 It is time for the Garden Share Collective to post about their veggie gardens. That link is to Lizzie's blog, with all the links at the bottom. Thanks Lizzie, for hosting this. Last month's report is HERE. And we are nearly there. We ordered our patio in March, and after a LOT of mucking around by the builder, we may have their part finished before Christmas. Maybe. This is the last concrete pour, with the last of the lawn in the back yard disappearing. Concretors at work. Their boss loved the garden - he didn't realise cucumbers could climb - he has been growing apple cukes on the ground for ever. Tradies who come here a few weeks apart are stunned by the growth in the garden since last time they were here. The main view of the veggie garden, although walls still have to go on the garage extension and garden shed. We have lost a lot of morning sun on the beds, but they seem to be okay. I have all the garden stuff out in the shed area, and it is stunning to be able to find things when I want them, and to be organised. This is my potting area, which is slowly coming back under control. Once the pumpkins die, there will be a major re-organise. The pumpkins are doing well in the worm bins (one on the left is running behind), and I need to move the roses, fast. So, with all this going on, I am going to beg Lizzie to accept that I will not totally, formally report. I can say - don't bother growing celery from the base - the product is almost useless, although it looks pretty. Good for a garnish, and that is about it. The Bok Choi and Leeks have all run to seed. It has not been a good year for Garlic. We haven't got tomatoes in spring, but I reckon we will be able to eat the first one tomorrow - if we are really hungry. Nothing new planted, too chaotic. Capsicum seedlings coming along ready to go out (Thanks Lizzie, the Hungarian Wax is going nicely). That's it - you might also care to see another post I made during the month - warning - ornamentals only. Except there is one potted tomato there. It is looking wonderful! I am jealous you have zucchini to harvest already but I am sure we will all get our fill and more over Summer :-) Have a great month. Glad to hear your Hungarian Wax peppers are going well. They are hardy beasts, I just don't love them that much. Your concreting looks pretty flash too, I bet its easier to get around the garden now too. I hope you get to eat your tomato soon. Oh wow! I have path envy :) that looks so nice and neat. I too love to show visitors my veggie patch. It's been lovely watching your garden develop and take shape over the past few months. I'm amazed at how established and productive everything looks. You've done a great job. It must be such a relief that everything is nearly finished.